In the modern society, an assistive/powered suit has been developed to enhance the limb and trunk movements by mechanical force. The effective output of assistive products needs cooperation between the users, that is, human beings and the machine. The present study investigated the motor control of external forces that assist with physical exertion. Sixteen adult male participants performed isometric elbow flexion under two conditions of submaximal workload (20% and 40% of the maximal voluntary contraction) and four levels (0%, 33%, 67%, and 100%) of assistive force. The electromyographic (EMG) activity of the agonist and antagonist muscles (biceps and triceps, respectively) and rating of perceived exertion decreased with increased levels of assistive force under both workload conditions. 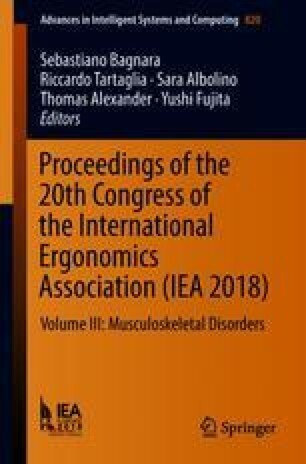 At the lower level of assistance (33%), the EMG amplitude of the biceps was near the expected amplitude, which denotes that the participants made good use of the assistive force. However, at the higher level of assistance (100%), it was far from the expected values at both workload levels. These results suggest that the effectiveness of assistive force changes according to the level of workload and assistive force, and that various human physiological regulations and motor control would be required during cooperative work with assistive force. This work was supported by JSPS KAKENHI (Grant No. JP 15K14619 and 17H01454).